The VSC integrates SnapMirror via the backup job option ‘Initiate SnapMirror update’. For this to work, a SnapMirror relationship must already exist, and below details how to do this. IMPORTANT NOTE: The VSC will update the SnapMirror for us if ‘Initiate SnapMirror update’ is ticked. Step 5 is only required if you want SnapMirror updates outside of the control of the VSC. 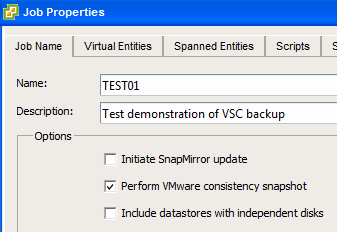 IMPORTANT NOTE: Suspend the VSC backup job before initializing the SnapMirror relationship! When the state is Initialized, we’re good to edit the backup job and tick the ‘Initiate SnapMirror update’ box, and Resume the backup job. It is recommended to backup all VMs in a datastore. If there are individual backup jobs for VMs in a datastore, each individual backup job requires a volume snapshot, and if all the jobs have update SnapMirror ticked, then a full volume SnapMirror update is run after each individual VM is backed up.